June 4, 2012 Nefer Khepri, Ph. D.
Do you enjoy doing little things for others when they least expect it? I do. I enjoy making someone a handmade card & sending it to them for no good reason. I may title it, “Happy Tuesday!” or “Happy Summer,” whatever strikes my imagination at the time. I send it and they love it, plus it comes as a huge & unexpected surprise to them. 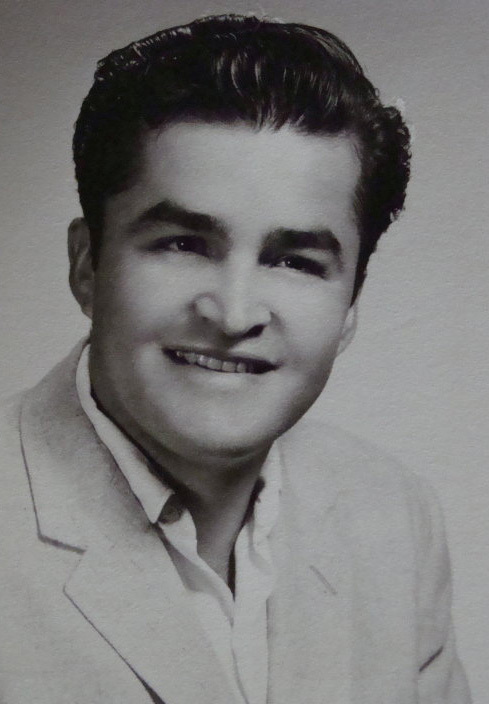 Here is a portrait of my dad from 1957 when he was only 21. He was an immigrant from Mexico and had come to America to work in the strawberry fields of central California. Once he had saved up enough money he traveled east with his brother, to Waukegan, Illinois where they both filed for their green cards. Mom’s reaction was to throw her head back & laugh. Dad was a 21 year old “kid” to my mom, who was 32 at the time. She told Dad how old she was & that he was “just a baby” to her. However, my dad was never a quitter. He kept coming around until Mom finally agreed to go out with him. Dad took her to a very cheap place to eat & Mom was really angry. She told my grandpa there was no way she’d date him again because he was cheap. Word got out and soon my dad’s friend heard what Mom had said. He came to see Mom to tell her the reason Dad didn’t take her anywhere nice is because he was sending every dollar he made, except for room and food, to his mother in Mexico to help send his younger brother to college. In fact, my dad worked as a strawberry picker, cherry picker, & janitor for 10 years to put my uncle through college. My uncle is now a multi-degree holder & both a doctor of engineering & a doctor of homeopathy who runs a very successful practice in Mexico ~ all thanks to my dad. So, Mom married Dad. I came along two years later. My parents ended up being happily married just 2 weeks short of 48 years when Mom passed away on January 20, 2008. Dad followed her on September 20, 2009. I had posted this picture of Dad to my Facebook group, Living in the NOW as part of an exercise we were doing about “Daddy gratefuls,” started by my friend, Sama Rose about her own father. Living in the NOW focuses on encouraging members to express gratitude for at least three things everyday and I encourage all members to post their gratitude lists to the group’s wall. Today, another member, Shaheed Haniff, asked if it was okay for him to colorize this picture of Dad. I thought, “oooh, what a great idea!” The artist in me found it very appealing, so I said sure, feel free to post what you have done. He did, and it just BLEW MY MIND!! Shaheed has never seen a color picture of my dad. Yet, he managed to get Dad’s coloring perfectly and admitted to me that the picture actually spoke to him and he was somehow guided. My dad often wore blue, so I wouldn’t be at all surprised if the suit he was wearing in this picture was actually blue. Purple is my favorite color, so I also love the background. Sometimes it’s the little things that mean so much. Today I received two wonderful gifts. A facebook friend sent me $30 as an early birthday present, and Shaheed sent me his lovely colorization of my dad’s portrait. I am incredibly touched by both of these gestures. I know that both gestures appear small in the eyes of the giver, but to me, they mean the world. I shall treasure this colorized portarit of Dad. I immediately saved it to my hard drive and will be printing it out on photo paper. My plan is to frame it and the black and white portrait so I can hang them side by side. Thank you, Shaheed, for your lovely gesture; and thank you to Ruth for your lovely generosity. The little things really DO matter and make living this life of ours wonderful! ..i believe what goes around comes around…Nefer..sweet little things..that you do for others are repayed..
btw..such a sweet story..appreaciate your honesty.